The 1951 North West 200 ran over an extended two day programme, as part of local celebrations for Festival of Britain year. Under a blazing sun, on the hottest day of the year so far, fifty one riders lined up for the start of the Junior 350cc, held on the Thursday. Sharing the front row of the grid with Armstrong’s works AJS, were the Norton partnership of Duke, Dale and Lockett. Lockett, a last minute replacement in the team for Harry Hinton, whose arrival from Australia had been delayed, would ride a 1950 model, whilst Duke would be equipped with a 1951 engine housed in a 1950 frame. As the flag dropped J S Slater’s AJS rocketed to the front. His moment of glory would be short lived. Duke led Lockett, Dale, Armstrong, and the private AJS of Robin Sherry, through at the end of lap one. His time of 7 min 58 sec, lowered the lap record by three seconds from a standing start; still short of his best time from the previous morning’s practice of 7 min 37 sec. Another new record of 85.73 mph, 7 min 45 sec on the following circuit, took the St Helens rider twenty six seconds clear of Lockett, and Dale a further two seconds adrift. With newcomer Sherry closing rapidly on Armstrong’s misfiring factory machine, news began to circulate around the course of a major accident at Drumslade, three miles from the start/finish. On a practically straight stretch of road, one machine had wobbled at speed, struck the grass bank on the left of the circuit, and rebounded into the road, bringing down nine other competitors. Thirty five year old William Bennison, from Sableford, Staffs, was rushed to hospital, but died shortly afterwards from his injuries. On his fourth lap Duke recorded a time of 7 min 27 sec, a speed of 89.19 mph, to better Artie Bell’s 1950 500cc record by three seconds. He pitted leisurely on the eighth lap, and rejoined the fray. By the end of his eleventh circuit Duke led Lockett by 4 min 15 sec, and had lapped all up to fifth place on the road. Lockett caused the sensation of the race when he led Dale through at the end of lap twelve. To keep weight to the minimum, Duke had opted to carry no plug spanner or spare plug. When lack of spark brought his Norton to a standstill at Shell Hill, Duke could only park his stricken machine and watch a titanic, all Norton battle develop between Dale and Lockett. At the end of the sixteenth lap Dale led by a single second. As the pair thundered through Portstewart and onto their final frantic eleven mile dash, Dale’s lead remained unchanged. He held the slender advantage at Coleraine, but Lockett was in front at Portrush. On the Coast road, with a last supreme effort, Dale whipped past his team mate, to head him home by two bike lengths. After an eternity in the pits whilst his team worked on the factory AJS’s defective rear brake, Armstrong followed Sherry home in fourth place. Left pushing at the start when his all new, 1951 model, refused to fire, it was Duke who led the high-speed Norton train through, at the end of the first lap of Saturday’s eighteen lap Senior race. At the fast right hander leading onto the start/finish, his machine snaked wildly after hitting orange peel thrown onto the road by spectators. It would be Duke’s only troubled moment, and for the next seventeen laps he set about systematically, destroying the record books and the opposition. Lap after lap Duke upped the pace, until on his seventh circuit, in a time of 7 min 22 sec, Geoff Duke became the first rider to lap the Triangle circuit at over 90.00 mph. On lap ten Duke raised the tempo and went around in 7 min 12 sec, a speed of 92.27 mph, and for the next eight laps, his pace never dropped below 90.00 mph, despite the frantic signals from the Norton pits to slow down. At the end of Duke’s 200 mile tour de force, Lockett was the only rider still on the same lap, albeit, five minutes behind in second place. On the penultimate lap Dale slowed at his pits for running repairs, but was waved through by team manager, Joe Craig. Riding one-handed, while holding a loose carburettor in place, Dale limped home in a distant third place, eleven minutes after Duke had taken the chequered flag. 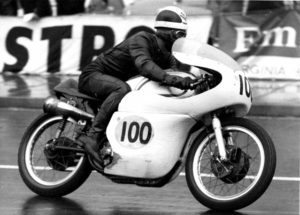 Arthur Wheeler’s Moto Guzzi leapt to the front of the fourteen 250cc contenders that started one minute after their 500cc counterparts. For the next sixteen laps, Wheeler pulled away from the bickering pack behind him. On the ninth lap he broke Ron Mead’s 1950 lap record of 74.23 mph with a speed of 74.53 mph. At the flag Wheeler had almost seven minutes to spare before David Andrews completed the distance to claim the runner up spot. The punishing demands of the course exacted a heavy toll on the Lightweight runners. W J Netherwood’s campaign was over on the second lap, and Maurice Acheson’s serious challenge for a top three finish ended when his Excelsior cried enough on the eighth lap. At the half way point in the race David Andrews held a safe but distant third place, over four minutes behind second place runner, Fron Purslow. On the final lap at Portrush, Purslow’s Norton ran out of petrol. Purslow coaxed the last dregs from the tank and restarted. Running on fumes, two and a half miles from home, on the Coast road, his engine died. Purslow pushed home to a standing ovation, to claim the final place on the podium behind Andrews. The 500cc Manx Norton, on loan to Reg Armstrong from the factory, would be the closest the 1952 event would come to boasting an official manufacturer’s entry. After three laps of shadowing Cromie McCandless, Armstrong hit the front when McCandless made an unscheduled pit stop. The four minutes lost as his mechanics tightened loose tank bolts on the Francis Beart tuned Norton, cost McCandless the race. Despite returning the fastest lap of the day at 88.78 mph, McCandless could not get near the dog fight that was developing at the front between Armstrong and Ivor Arber (Norton). For four laps Arber, an ex-fighter pilot, and holder of the Air Force Cross, traded places at the front with Armstrong, until the Dubliner’s chain broke. First lap early leader Harold Clark, made it a Norton clean sweep, coming home six and half minutes behind McCandless. It would be Arber’s only North West 200 victory. The Kettering rider lost his life after crashing his 499cc Beart Norton at Hillberry, later that year in practice for the Manx Grand Prix. For the opening laps of the 350cc race Rex McCandless matched his younger brother, by leading the field. McCandless held an eight second lead over D C Birrell (Norton), with A C Taylor (Norton) giving chase. 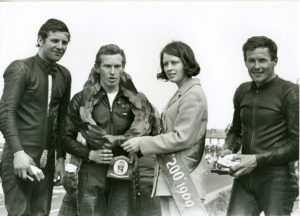 On the eighth circuit, whilst overtaking Dickie Carter, McCandless tangled with the 500c runner at Dhu Varren, causing both riders to crash out of the race. With McCandless out and otherwise engaged, the order at the front after half way saw newcomer H A Pearce (Velocette), ahead of the Nortons of veteran Albert Moule and Taylor. Moule’s lost the lead when he stopped to refuel, whilst Pearce completed the full distance without stopping. On lap thirteen he set the fastest lap of the race at 83.753 mph to take the victory by a minute and thirty nine seconds. For the second year in succession the bright red Guzzi of Arthur Wheeler led the 250cc field through Henry’s Corner on the opening lap. With expected challengers Wilf Billington and Ron Mead both retiring, Wheeler was never pushed over the sixteen laps, but still carved seventeen seconds of his 1951 lap record to raise the new standard to 76.96 mph on his way to his second Lightweight win. Once again David Andrews followed Wheeler home to claim the runner up spot. The much anticipated appearance of the ultra fast works Gileras with Dickie Dale and Reg Armstrong on board, fell far short of expectations. Instead, the performances of newcomer Syd Lawton and Ken Kavanagh on the works 500cc Nortons stole the 1953 headlines. As the temperatures soared, melting patches of tar around the course, Armstrong led the twelve strong Senior field away. By the end of the lap, both Nortons had posted speeds of 90.00 mph from a standing start, with Kavanagh leading his team mate by twenty five yards. Already Armstrong was losing touch back in third, with Dale completing the top four. 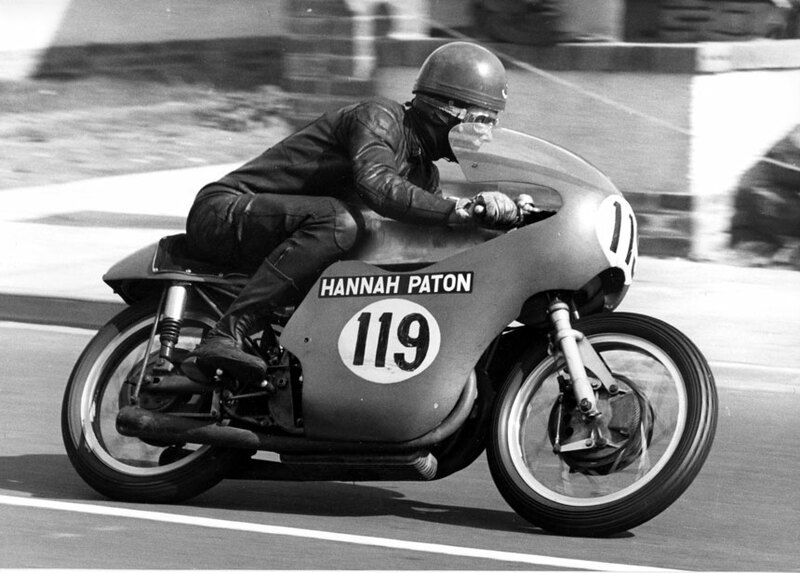 Lawton and Kavanagh traded record lap times as the miles fell away, and the gap between the Nortons and the Italian thoroughbreds grew. Kavanagh began by bettering Duke’s standing record by five seconds, with a speed of 93.71 mph. On lap seven Lawton put two seconds of daylight between himself and Kavanagh, going around in seven minutes exactly, to raise the record to 94.82 mph.